If you’re looking for a brewer that makes fantastic coffee, look no further than the Bonavita BV1800. It handily outperforms any brewer under $200, and even goes toe-to-toe with the most premium of drip machines. Its bare-bones approach to brewing may not be for everyone, however. If you’re looking for the frills (programmability, temperature control, etc. ), you’ll have to look elsewhere. Going toe to toe with high-end drip machines from the likes of Technivorm, the Bonavita BV1800 handily achieves many of the same performance benchmarks—at less than half the price. This sleek, powerful, German engineered brewer is a favorite amongst coffee aficionados everywhere. If you are looking to brew an excellent cup of drip coffee without dropping $300+, Bonavita has exactly what you’re looking for. For a coffee machine costing over $100, the Bonavita BV1800 features list is quite short. Evidently, Bonavita takes a similar approach in product design to Technivorm; focusing only on the features that ensure a fantastic brew and stripping all the “gimmicks.” The priorities are clear: A powerful dual coil boiler, an insulated tube for transporting hot water, and a large showerhead nozzle for ideal extraction. Are these enough to ensure a fantastic brew? The single most important consideration for a fantastic cup of coffee (beyond the beans and grind) is temperature. Most generic department store brewers struggle to hit 180° F, failing to extract all the subtle nuances of coffee flavor. The result is bland, under-flavored, and under-extracted coffee. For an ideal extraction, coffee should be brewed at 200-205° F. The Bonavita BV1800 achieves this temperature range with ease. Its fantastic 1400 watt boiler consistently heats water to 205° F, ensuring a perfect extraction every time. In this respect, the Bonavita is every bit as good as the pricier Technivorm. Disappointingly, like its Technivorm inspiration, the Bonavita BV1800 does not feature variable temperature control. While it brews at a fairly consistent temperature (200° – 204° F), the difference of a single degree can impact the expressed flavor profile of your coffee. A couple of degrees hotter, and you get a heavier body and bolder flavor. A couple of degrees cooler, and the brightness of the blend takes center stage. As such, even the BV1800’s excellent boiler will struggle to maintain consistency across batches. Outshining Technivorm machines, Bonavita BV1800 features a significantly superior showerhead. Opting for a rounded design instead of a rectangular one, the showerhead disperses water evenly and completely, ensuring ideal saturation. The only issue with the showerhead is pressure, with some customers noting that the front-most spray rarely produces water. This is a minor issue however, as the Bonavita BV1800 provides superior saturation to any machine in its range. 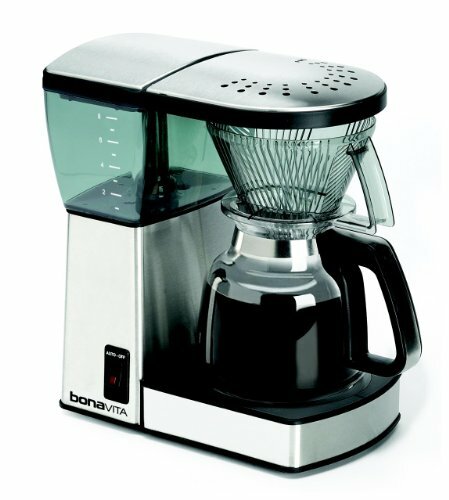 The Bonavita BV1800 also includes an excellent 8-ounce glass carafe. Although it lacks the heat retention features of other Bonavita models, the included carafe boasts one of the best spouts available. Where many carafes struggle to achieve a consistent stream, the BV1800’s carafe produces a perfect, mess-free pour. It is unfortunate, however, that the carafe volume is so low. While other high-end brewers brew up to 12-cups per cycle, the Bonavita BV1800 is limited to 8. Serious coffee addicts will find themselves thirsting for more. The last significant disappointment is the BV1800’s lack of programmable features. Opting to mirror Technivorm’s design philosophy at a lower price point, the Bonavita made itself vulnerable to new competition in the high-end drip machine segment. Clearly taking notes from long-established brands like Technivorm, the Bonavita BV1800 strives for sleek minimalism. For the most part, it manages to capture this retro aesthetic. A short stainless steel column forms the main body of the device, serving as a platform for its graduated water reservoir. The water reservoir lid houses the BV1800’s showerhead, which locks into place over an insulated tube. The included filter basket is reminiscent of a classic pour-over brewer, and attaches directly to the carafe rather than being slotted into the machine. All of these elements come together in a design that is both simple, and wholesome. Unfortunately, Bonavita fails to achieve the elegance of its inspiration: Technivorm. In comparison, the BV1800 looks stocky and clumsy, like the Moccamaster’s awkward younger brother. The Bonavita BV1800 is smaller and lighter than the competing Technivorm, which gives the impression of a less sturdy construction. Some customers online tend to agree, citing the flimsiness of components like the water reservoir lid, whose hinges can dislocate with slight pressure. This grievance is minor, however. The Bonavita is still expertly engineered, and the brushed stainless steel enclosure protects its most vital components from wear and tear. German engineered and Chinese built, the Bonavita BV1800 build quality is on par with other devices in its price range. It may not be as sturdy as the Dutch built Technivorm, but with such a significant price advantage, it doesn’t have to be. 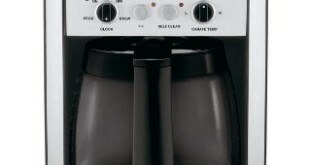 How Much Does The Bonavita BV1800 8-Cup Coffee Maker? We partnered up with Amazon to provide you the lowest price for the Bonavita BV1800. Hi. The amazon price is $254, which is what your link leads to. Not sure why you advertise it in the link as $149, since amazon’s price is more than $100 higher..